What changes will make the 2019 Mazda CX-9 different? Possibly an answer to the question of whether Mazda will offer its flagship crossover with a diesel-engine option, like the one it’s promised for the smaller 2018 CX-5 compact crossover. Barring that, don’t expect the shapely midsize seven-seater to change significantly until a midcycle refresh, likely for model-year 2020 or ’21. On the chance Mazda will add a high-mileage, high-torque diesel alternative to the CX-9’s only engine thus far, a turbocharged gas four-cylinder. The 2019 CX-9 would be the first seven-seat midsize crossover to offer a diesel engine — and only the second overall, after the five-seat Jeep Grand Cherokee. If you’re charmed by the CX-9 but disinterested in a diesel, you probably shouldn’t wait for the ’19. The 2018 model lineup should reprise base Sport, better-equipped Touring, popular Grand Touring, and top-drawer Signature grades. None is apt to be materially different from its 2018 counterpart, but all are likely to cost more. A potential influence on your decision to purchase a Mazda crossover now or to wait is the automaker’s plan to add another one, probably in 2021, as a 2022 model. Likely to slot in size and price between the CX-5 and the CX-9 and possibly badged the CX-6, Mazda predicts the all-new crossover could become its best-selling vehicle. Yes, if this smartly styled, well-engineered crossover meets your SUV requirements, and those requirements don’t include a diesel engine. Bowing for model-year 2016 to replace the bulkier 2007-2015 original, this second-generation CX-9 spearheads Mazda’s move upscale. 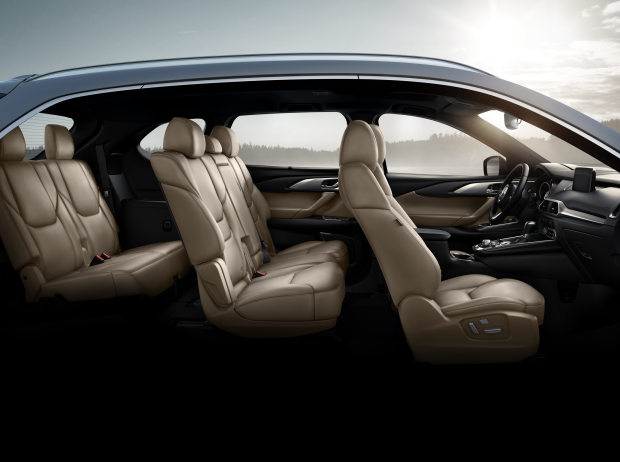 For example, every CX-9 save the Sport includes leather upholstery. With touches like real rosewood cabin trim supplied by the Japanese guitar maker Fujigen, the Signature edition challenges premium-class crossovers. Sharp handling and good fuel economy are also virtues. And credit Mazda with expanding safety features for model-year 2018 by making autonomous emergency braking and blind-spot and rear cross-traffic detection standard across the board. It also filled in some gaps in the CX-9’s available features by introducing amenities like rain-sensing wipers, a heated steering wheel, and heated second-row seats. There’s are still a few expected conveniences the 2019 CX-9 doesn’t offer, such as a hands-free power liftgate. And if you fancy your seven-seat crossover with anything but a turbocharged four-cylinder engine, you must shop elsewhere. Don’t look for visual changes, other than perhaps a new color choice or two, until the midcycle update coming early next decade. Even then, the CX-9’s basic size and shape won’t change. Its long wheelbase (the distance between front and rear axles) and curvaceous body create pleasing proportions. Mazda’s distinctive grille and the slimline LED headlights and LED daytime running lights standard on all models fashion an arresting bow. Sport and Touring should return for 2019 with 18-inch alloy wheels, Grand Touring and Signature with 20s. Mazda increased sound insultation for 2018 and the ‘19’s cabin will again enjoy an air of sophistication suitable for a premium-segment crossover. Liberal distributions of leather and wood complement craftsman-like attention to the gauges and controls. All 2019 models should return with a 7- or 8-inch dashboard infotainment screen. Unaltered dimensions will again mean very good room and comfort in the first two seating rows. Third-row passengers, however, get less room than in such rivals as the Honda Pilot, Nissan Pathfinder, Toyota Highlander, and Dodge Durango. Cargo space is tight behind the third-row seat and the maximum volume of 71.2 cubic feet is at the low end of the competitive set. The lead story for 2019 would be introduction of the diesel engine. It would be an alternative to the 2.5-liter turbocharged four-cylinder that became the CX-9’s sole engine with the 2016 redesign. Rated 227 horsepower (250 using 93-octane gas) and a stout 310 pound-feet of torque, it replaced a V-6 that had 273 horsepower and 270 pound-feet. Generating maximum torque at just 2000 rpm, the turbo-four takes a moment to deliver acceleration off the line, but provides good power and response once underway. The only time it feels taxed is merging with very fast-moving traffic or in high-speed-passing attempts. A 2019 turbodiesel option would likely mirror that performance, but with even better fuel economy — although it could also add $3,000 or so to the purchase price. If Mazda taps the 2.2-liter slated for the CX-5, it would generate some 173 horsepower and 310 pound-feet of torque. 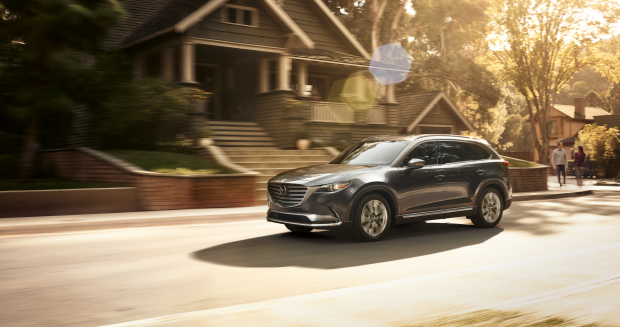 With either engine, the ’19 CX-9 would retain a six-speed automatic transmission and a choice of front-wheel drive or all-wheel drive (AWD). It also would continue to count handling among its assets. Precise steering, good balance, and a well-sorted suspension help it feel surefooted and composed dicing through city traffic or dashing down a twisty road. The ’19 will benefit from Mazda’s model-year-2018 addition of its G-Vectoring Control, which improves initial turn-in on cornering by momentarily retarding engine power to transfer weight forward. To the driver, it’s imperceptible, but effective. Improbable, without addition of a turbodiesel. Expect the 2019 CX-9 with the gas engine to repeat 2018 EPA ratings of 22/28/24 mpg city/highway/combined with front-drive and 20/26/23 mpg with AWD. Tack on an improvement of 10 percent or so across the board with the speculative turbodiesel engine. As it is, the 2018 CX-9’s EPA ratings were tops overall among three-row crossovers in its competitive set, edging out the turbo-four Ford Explorer and the four-cylinder GMC Acadia. The CX-9 is tuned to run on regular-octane gas, but Mazda acknowledges the more expensive premium-octane will extract the full measure of the CX-9’s performance. Mazda would be wise to continue to underscore the 2019 CX-9’s class-above positioning by adding amenities available on top rivals. A 2018 CX-9 buyer couldn’t get, for example, a power-folding third row seat, a power adjustable steering column, a hands-free liftgate, ventilated front seats, or a panoramic moonroof. Integrating such features is a challenge for this relatively small-scale, independent Japanese automaker. So Mazda deserves credit for covering the basics and for refusing to skimp on safety. 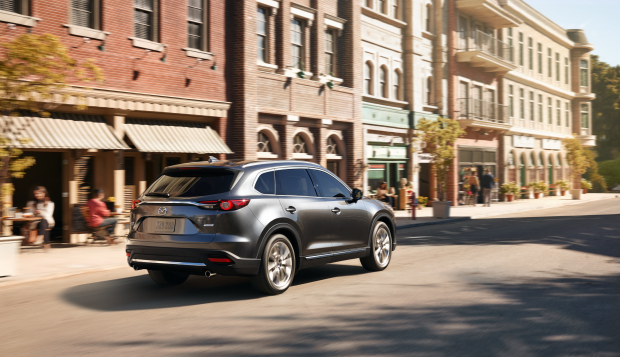 Smart City Brake Support (SCBS), which includes autonomous emergency braking to mitigate a frontal collision, was made standard on the Sport model for 2018, so now every CX-9 comes with it. Same for blind-spot and rear cross-traffic detection. Mazda introduced a front-parking sensor and also extended its i-Activesense safety suite from the Grand Touring and Signature models to the Touring level. This comprehensive kit includes lane-correcting automatic steering, adaptive cruise control to maintain a set distance from traffic ahead, automatic high-beam headlights, and a head-up instrument display that projects key data onto the windshield. For 2019, it could well extend i-Activesense to the Sport model, as well. Otherwise, expect every ’19 CX-9 to continue with such standard features as height-adjusting automatic headlamps, and exterior mirrors with turn-signal lamps. They’ll likely increase, but don’t count it on. Surprisingly, Mazda held the line on base prices for the 2018 Grand Touring and Signature grades and decreased base prices roughly $600-$1,000 on Sport and Touring models. It also maintained its destination at $940 for ’18 (estimated base prices in this report include the fee). Interestingly, the automaker says Grand Touring and Signature models account for more than 50 percent of CX-9 sales, so buyers seem to be responding to the upscale appeal of the CX-9 in those trim levels. Expect the 2019 Signature model to again come standard with AWD, a feature that should again add $1,800 to the base prices of the front-wheel-drive versions listed here. Mazda’s unpredictable approach to CX-9 base prices extended back to model-year 2017, so we’ll list here 2018 base prices and note that they could well be unchanged for model-year ’19. The 2018 CX-9 Sport started at $33,070 and can be expected to return for 2019 with standard features that again include the aforementioned safety items, plus an electronic parking brake, 18-inch alloy wheels, rear backup camera, Mazda Connect infotainment with a central console control and a 7-inch color display. Optionally available again for around $1,300 should be an option package containing a power driver’s seat, heated front seats and mirrors, and some of the safety features from i-Activesense, including lane-maintaining automatic steering, adaptive cruise control, and automatic highbeam headlamps. Base price for the 2018 CX-9 Touring was $35,900. Expect it to again build on the option-package-equipped Sport model by including as standard an auto-dimming rearview mirror, rain-sensing windshield wipers, HomeLink garage door opener, black- or sand-colored leather upholstery, keyless entry with pushbutton start, a power liftgate, power front seats, and an 8-inch touchscreen. Expect the Touring Premium Package to return as a $1,890 option. It would again include a power moonroof, a navigation system, automatic on/off headlights, LED fog lights, premium 12-speaker Bose audio and satellite radio, the front parking sensor, rear backup sensors, and second-row retractable sunshades. Priced from $41,410 for 2018, the ’19 Grand Touring model would enhance a Touring Premium Packaged-equipped CX-9 with standard steering-linked headlamps, aluminum interior trim, automatic high-beam headlamps, a windshield-wiper de-icer, roof rails, a heated steering wheel, heated second-row seats, and memory settings on the driver’s seat. The 2018 CX-9 Signature was priced at $45,255, and the ’19 version can again be expected to come with AWD and all the previously cited amenities, as well as LED signature accent grille lighting and LED accent lighting around the shift lever, Nappa leather upholstery, and the rich rosewood trim. Mazda has not offered the Grand Touring or Signature models with factory options. Look for a release date for the 2019 CX-9 during the second quarter of 2018.